Wahl blades are made from the highest quality stainless steel that is best suited for haircutting. Wahl uses high precision grinding technology to ensure the best cutting performance. 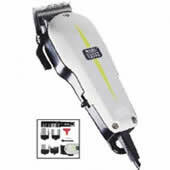 The Wahl super taper features a V5000 professional clipper motor providing a continuous and powerful low vibration clipping action. Wahl is dedicated to providing high performance, practical hardworking tools, designed to the highest standards. Wahl manufactures proffesional products in the USA and Europe, to provide hairdressers and barbers with top quality, high performace products. The Wahl super taper with its classic stylish and ergonomic design has been Wahl's number 1 professional clipper for many years. This durable hardworking product is perfect for continual every day use.